NEW YORK – January 13, 2011 – On January 10, 2011, Kent Swig, President of Swig Equities, LLC, joined nearly 200 guests at the Museum of American Finance Annual Gala in honor of Blackstone Group chairman emeritus Peter G. Peterson, who was presented with the 2011 John C. Whitehead Award for Distinguished Public Service and Financial Leadership. The gala dinner took place at 48 Wall Street, home of the Museum and a landmark building owned by Swig Equities. 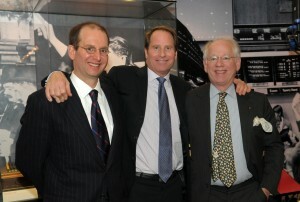 Pictured in photo: Kent Swig (center) with Kirk MacDonald (right) and son Bryce MacDonald (left), of MacDonald & Cie, at the Museum of American Finance Annual Gala at 48 Wall Street on January 10, 2011. The Museum of American Finance, an affiliate of the Smithsonian Institute, annually presents the John C. Whitehead award to a person who has demonstrated a high order of achievement and leadership in the field of finance, and also served with notable distinction in the public sector. The Museum is the nation’s only public museum dedicated to finance, entrepreneurship and the open market system. With its extensive collection of financial documents and objects, its seminars and educational programming, its publication and oral history program, the Museum portrays the breadth and richness of American financial history achievement and practices.